A keyword tool enables you to discover additional terms you haven’t thought of and helps you determine which terms are most important — which terms are used most often by people looking for your products and services. Both free and paid versions of keyword tools are available. 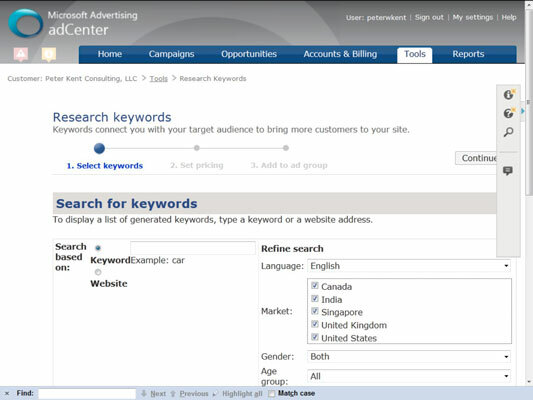 Both the major PPC (Pay Per Click) advertising systems provide keyword-analysis tools, though for Bing you have to sign up for a PPC account (or at least begin the process; Yahoo!’s PPC system is now run through the Bing system, Microsoft adCenter). You tell Bing where you want to run your ads in the first step, create an ad in the second step, and then, in the third step, you pick your keywords. You see a page similar to that shown. You enter some keywords and then click Next. A screen similar to this one appears. 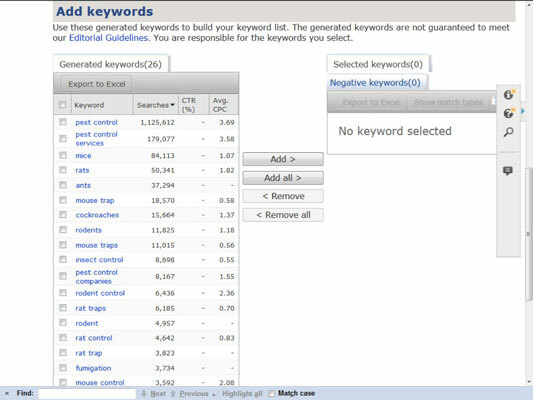 This screen shows a list of suggested keywords with an estimate of the number of searches for that term in the previous month. You can go down the list clicking the check boxes next to the keywords you want to use and then click the Add Keywords button at the top of the list to place those keywords into the keywords box top left; you can copy the keywords out of that box if you want.